SPINACH - LETTUCE SALAD ..a great spinach salad recipe to try ! Fill large bowl with spinach and lettuce that has been torn into bite-size pieces. Fry and crumble bacon into bowl. Chop eggs and add to the lettuce and bacon. Add Pepperidge Farm dressing and chopped onion. 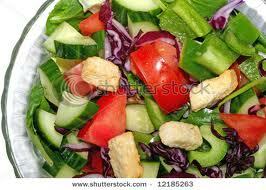 Mix dressing ingredients and pour into salad bowl just before serving. Toss...and the spinach salad recipe is ready to serve..great for appetizers !